Every now and then, something special pops up. Something that breaks new ground. 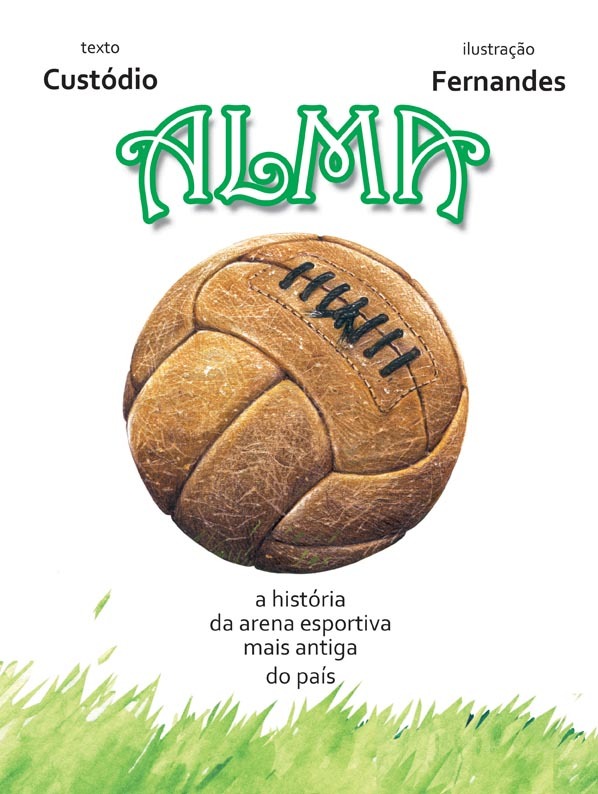 Like the comic book “ALMA” (SOUL), that is being launched this coming Tuesday at the HQ Mix bookstore, a few hundred meters from the Pacaembu stadium, São Paulo. 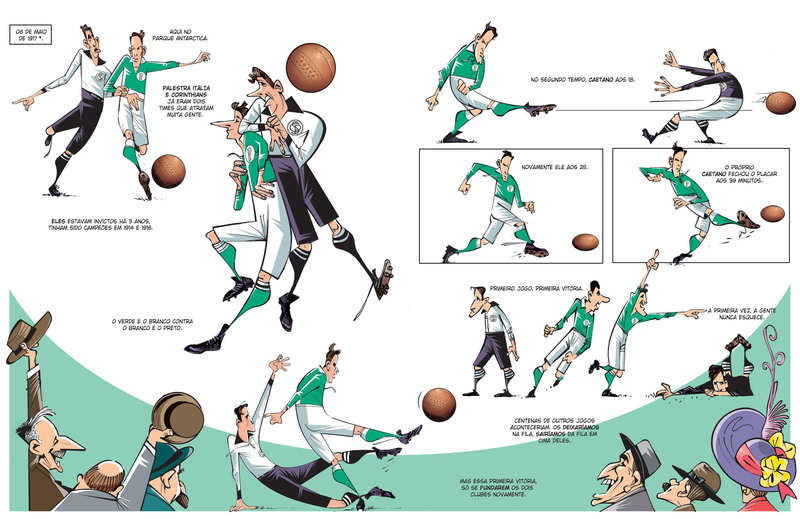 “ALMA” is the work of recognised cartoon artists Custódio (text) and Fernandes (drawings) and tells the story of the oldest sports and leisure area in Brazil, the legendary Parque Antarctica. Not only is the Parque Antárctica the only space that have seen all major Brazilian football players in action – including Charles Miller, Friedenreich, Garrincha, Pelé, Ademir da Guia and Marcos – but has also staged many a noteworthy event, including the very first official game of football in Brazil and the first car race in Latin America. The Parque Antarctica was inaugurated in 1890. 30 years later, in 1920, the complex was purchased by the Sporting Society Palmeiras, who used it as home grounds while simultaneously making significant reforms. In 1933, the Palestra Italia stadium was officially opened – at the time recognised as the most modern stadium in Brazil, holding for some 30.000 spectators. Custódio had the idea about the comic book when he learned that the Palestra was making way for the constructions of the New Arena, scheduled to stand ready by the end of 2013. Every day more fascinated about the rich story involving the Parque Antarctica and the Palestra Italia, he called upon Fernandes – a top cartoonist and caricaturist – to join in on the project. The result is a visually stunning and unique piece of art, telling a story over 120 years that is intimately linked with that of the Sociedade Esportiva Palmeiras. While finalising the comic, the authors experienced the ecstasy of Palmeiras concurring the Brazil Cup trophy and the sadness of the relegation in the Brazilian championship. As Custódio himself concludes: the entity is bigger than the men who passes through. As mentioned, the book release takes place this coming Tuesday (11 December) at the HQ Mix bookstore, Rua Tinhorão 124, Pacaembu, São Paulo, between 7pm and 1am. There’s also a second launch on the Saturday 15 December, at the Pizza Restaurant Prestíssimo, Al Joaquim Eugênio de Lima 1135, Jardins, São Paulo, from 7pm and onwards. There’s also a hotsite (in Portuguese) and an e-mail for online orders (R$ 35.00 including p&p inside Brazil). This Tuesday I’ll be at the QG Mix securing my copy and a couple of autographs from the authors. Hope to see you there! Next When the Saint goes marching in… And out. Good for you, Leo! I’m really looking forward to getting my hands on a copy; only seen previews so far. Cheers, have a great weekend.